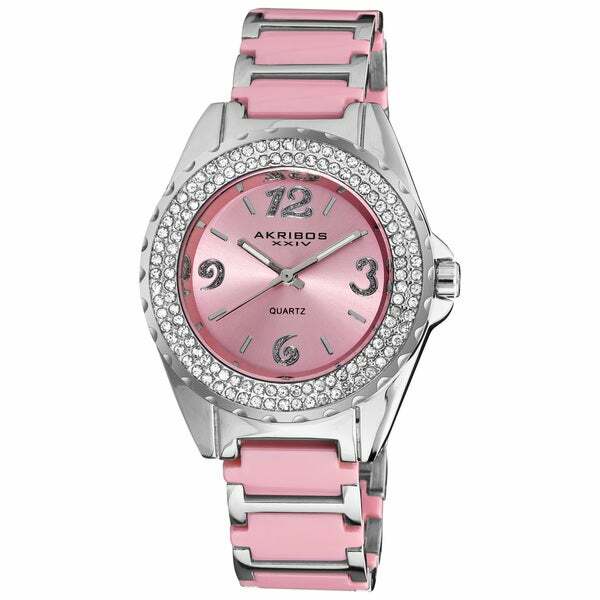 This sparkling Akribos XXIV women's quartz watch features two rows of genuine crystals on the bezel. The glittery Arabic numerals on the sunray dial add to the sparkle. Ceramic inserts adorn the bracelet of this watch. Dimensions Case measurements: 39 mm wide x 39 mm long x 11.5 mm thick. Bracelet measurements: 18 mm wide x 7.5 inches long. I like that this is a ceramic watch which i favor for it's beauty and comfort. Also the color of pink is very attractive and goes with most looks.I would recommend this watch! I like this watch, it’s a little bigger than I thought it might be. Runs big on my wrist I’m gonna have to have two links removed. It’s a good looking watch and if your looking for some bling , it’s has that two. Love this watch!!! I would recommend to anyone who love pink. The pink was a little lighter than in the picture, but love it away. Absolutely love this watch.. I have ordered numerous watches from overstock, and. Very satisfied with every purchase. Bought two. One was a gift. Get compliments on this watch all the time. in the image, the pink in the band looks to be some sort of metal, but it's not... it's some sort of other material and it looks matte against the shiny silver material. I feel rich with my watch.,people must be jealous and they want one also. So let’s all share. We will also all feel like sharing. It so nice to be able to do so. Band is much lighter than the picture. More of a pale pink. same problem wit the clasp but much more fun to wear. "Can links be taken off to make smaller?" "Just purchased and watch stops working. To get it working again I have to pull out the side knob and push it in again. I also purchased a 2nd watch to give as a gift and now am worried that the same thing will happen. What do I do to get it fixed?" We are sorry to hear that your watch did not work. Please contact customer care and we will be happy to assist you with your purchase. Overstock was wonderful. Sent me a return shipping label and sent out a new watch. Thanks Overstock for your prompt attention.